Contact records contain a reference to an Account in their AccountId field. Nearly all records contain a reference to the Salesforce user who owns the record in an OwnerId field. Restored by another table rule. A checkbox which determines whether or not the reference field should be restored. If not checked the field will not be modified on an UPDATE and will take the default value on an INSERT. The name of the reference field with a superscript indicating the Salesforce table to which it refers. The action to take if the value of the reference field in CopyStorm points to a record not present in the target Salesforce. 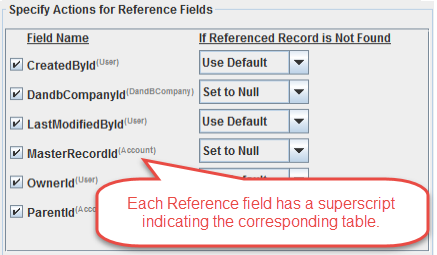 Set to Null If the referenced record is not already in Salesforce then set the reference field to null. Skip Record If the referenced record is not already in Salesforce then do not restore the record. Create Record If necessary, create the referenced record in Salesforce. Reference field linking to the Salesforce User table have a different set of options. Common reference fields of this type include “OwnerId”, “CreatedById”, and “LastModifiedById”. Salesforce User references are treated differently because Salesforce will not permit a record to be created with an owner that is an inactive Salesforce User. Use Default If the referenced User record is missing or is an inactive Salesforce User then use the Salesforce User specified as the default User on the “Global Parameters” tab. Skip Record If the referenced User record is missing or is an inactive Salesforce User then do not restore the record.